We have developed synthetic routes to a wide range of unnatural amino acids with new functions that are not found in nature. Examples include photocaged amino acids, photocrosslinkers, fluorinated amino acids, and amino acids modified with biophysical probes. We are synthesizing these compounds in order to engineer the function of proteins through site-specific incorporation of unnatural amino acids into the polypeptide chain. 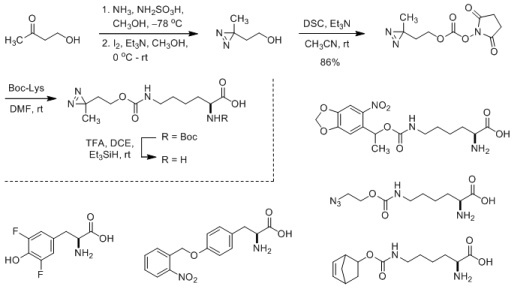 The synthetic routes to these amino acids need to be scalable to multi-gram quantities.